The MHI Hydrolution is a complete system for space heating and hot water production in domestic and smaller commercial buildings. 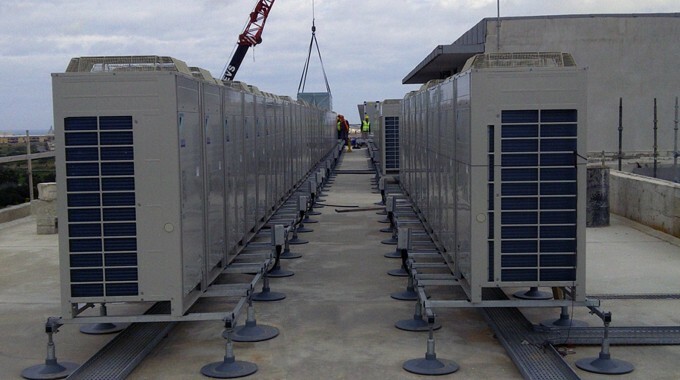 Mitsubishi Heavy Industries (MHI) has entered the UK heat pump market with an innovative product range they call Hydrolution – These air-to-water systems build on the high efficiency DC inverter technology used for in their air conditioning units. The heat pump and hot water storage system achieves an impressive CoP of 4.08 in heating mode, and is specifically designed from easy installation as the Hydrolution units are pre-charged with refrigerant – a major advantage over some heat pump systems where the installer needs refrigeration gas handling certification. The MHI Hydrolution is a complete system for space heating and hot water production in domestic and smaller commercial buildings. Water is heated and stored at up to 45°C – 58°C by operating the outdoor heat pump and this can be topped up on demand to 65°C by the unit’s integral 9kW immersion heater, or any connected external source, such as a conventional gas boiler or solar panels. 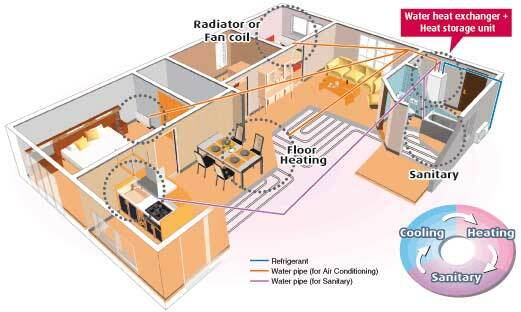 Alternatively, in hot weather the heat pump can be ‘reversed’ to chill water for underfloor cooling. As an air-to-water heat pump, MHI’s Hydrolution uses ‘free’ outdoor air energy to heat water, albeit at a lower temperature than a standard boiler system would; this makes Hydrolution particularly suitable for underfloor heating systems. It can be plumbed into a building without the cost and disruption associated with installing ground source heat pumps, such as digging bore holes and laying coils. We were impressed with how compacted the Hydrolution heat pump is. The outdoor unit is about the size of a large suitcase and can be wall or floor mounted in any convenient position up to 12m from the indoor hot water storage unit. With a footprint of 600mm x 650mm the indoor unit is easy to install even where space is limited, and incorporates a 270 litre storage cylinder, circulating pump and immersion heater. 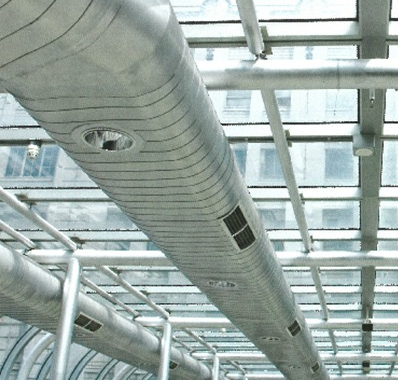 In the face of rising energy costs and growing pressure for greener buildings, heat pumps are proven to provide a reliable renewable energy option for space heating and sanitary hot water production. 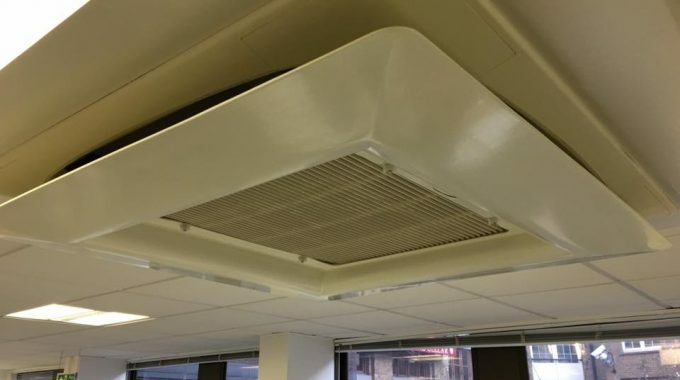 MHI’s European Sales Manager, Des Franklin, comments: “MHI has developed Hydrolution specifically for the UK and European heating markets where heating engineers might not have air conditioning refrigerant handling expertise. An exciting new concept in heat pump technology, Hydrolution offers all the benefits of high efficiency with ultra simple installation”. Replace your air conditioning for free – surely not?